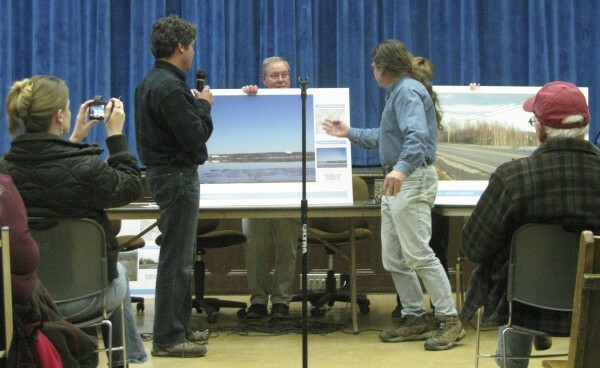 David Graham (left) of DCP Midstream debates the aesthetics of his company's proposed propane terminal project with Peter Taber (right) of Searsport at a 2012 meeting. SEARSPORT, Maine — Opponents of a controversial liquid propane gas terminal and storage tank project reacted with cheers and relief Tuesday to the news that the developers are withdrawing their application. Roz Elliott, spokesperson for Denver-based DCP Midstream, cited the Searsport Planning Board’s initial deliberations last week on the $40 million project, during which board members determined that several elements of the application did not meet the town’s ordinances. The developers had already received the federal and state permits necessary to construct the tank in the Mack Point industrial zone, but the Searsport Planning Board found that the project spread into the town’s commercial district in a way that is not permitted, among other ordinance and zoning problems. She said that the company does many projects across the country, and getting to this level of planning for the Searsport project was among the most expensive, though she did not specify how much DCP had spent to date. “Very extensive time, resources, passion — we really believed in this,” Elliott said, adding that the company decided to withdraw the application “as a courtesy” to the Searsport Planning Board. Longtime Planning Board Chairman Bruce Probert said Tuesday evening that he was not surprised by the withdrawal decision and that he believed that DCP Midstream could see the writing on the wall. The company already spent a lot of money on the project and likely didn’t want to throw more at something that would not be passed, he said. The planning board is not quite through with the application yet, he said, with members awaiting a letter from DCP Midstream that has language concerning the application withdrawal requested by the board’s attorney. If they don’t receive the letter, board members will continue to go through the findings as they have been, with the next meeting scheduled to start at 6:30 p.m. Wednesday, April 3, at Union Hall. DCP Midstream first approached the town of Searsport about building the project — complete with a 14-story-tall propane storage tank — nearly three years ago, in the summer of 2010, according to previously published BDN reports. Later that fall, the company sent letters to residents with information about the project. Propane would arrive at Mack Point’s existing deep-water import dock via four to seven tanker ships annually. During the winter heating season, as many as 50 trucks a day could fill up at the facility to load propane and make deliveries. Searsport’s Mack Point is located across from Sears Island and is an existing fuel depot, accepting deliveries and storage of gasoline, diesel, heavy fuel, ethanol and coal. But many in the town of 2,800 people reacted to the propane proposal with skepticism and alarm. A year after the company first indicated it was interested in Searsport, residents and midcoast environmentalists geared up to fight back. The opponent group Thanks But No Tank formed to bring attention to the project and to concerns such as increased truck traffic, the danger of vapor explosions called “BLEVEs,” and decreased property values in the “blast zone” around the storage tank. Also, the Islesboro Island Trust, a land trust on the nearby island, paid for former White House counterterrorism adviser Richard A. Clarke’s consulting firm to do a safety analysis of the project. Other communities in the midcoast area sent letters of concern to the planning board, saying that it was a regional and not a local project and that the final decision shouldn’t rest with the local panel. By last month, a lawsuit against the Maine Department of Environmental Protection by project opponents was pending and the Army Corps of Engineers had been put on notice for another suit. “My clients have no choice but to fight this to the bitter end,” Hinchman told the BDN last month. Opponents’ efforts to slow down the project with a six-month moratorium on liquid propane gas terminals were voted down by residents last March during the annual town meeting. But over the last three years, major changes in the domestic propane market — a “glut of propane,” according to some opponents — have meant that existing import facilities are not being used. Many in Searsport believe that DCP intended to use the facility to export propane overseas, an idea which caused them consternation. Elaine Tucker, a Belfast Realtor who had spoken about the pall the proposed tank has cast on the area’s real estate market during the series of 11 public hearings held last fall and this spring by the Searsport Planning Board, said Tuesday that she was grateful to learn of DCP’s withdrawal. She also said that she bets some of the prospective real estate buyers who have been biding their time until the planning board made its final decision will be grateful — and the sellers will be, too. The tank has affected the market not just in Searsport but in Belfast, too, she said. Buddy Hall, who owns Angler’s Restaurant and the Bait’s Motel, located on Route 1 very close to where the tank would have been located, has been fighting the project, saying that it would be catastrophic — and dangerous — for his business. His attorney, Ed Bearor of Bangor, said Tuesday that he and Hall are relieved. David Gelinas, president of the Penobscot Bay & River Pilots Association, said that he was hissed at by some of the project opponents when he spoke in favor of the project during one of the public hearings on the tank. Gelinas wondered if the board’s initial decisions on the LPG project really mean that there is not enough room at Searsport’s Mack Point for industrial projects. If that’s the case, he said, the community and state may have to look at nearby Sears Island. According to the 2009 Sears Island agreement, endorsed by then-Gov. John Baldacci, a 330-acre parcel of the island is under the management of the Department of Transportation for transportation uses, including a cargo terminal. The agreement requires that the Mack Point terminal be fully developed before any development is done on Sears Island. “Think of all the arguments against the tank: the height of the tank, the visual impact, the proximity to Route 1 and to Anglers Restaurant. All those issues could have been completely addressed by siting this on Sears Island,” Gelinas said. He also questioned why some opponents were so worried about the idea of an import versus an export facility. But the specter of future industrial applications could not dim the luster of the day for longtime opponents such as Anne and Ben Crimaudo, Searsport residents who have been fighting the tank for two years.